Great location! Very near the old bridge and a private gated parking space. 1.The spacious room with comfortable beds and well_appointed kitchen. 2.the kind and friendly host who speaks very good English. 3.the reasonable price compared with others. 4.location :3minuts walk to the old town and parking lots. The appartment was clean and comfortable. The host was very friendly and welcoming. Highly recommend you stay here when visiting Mostar. Samir was a most helpful host. He waited for us upon arrival to show where the complimentary parking is, shared ideas on where to eat, and he helped us with laundry. We had been in Whatsapp contact with our host Samir beforehand and had alerted him to problems with our phones so calling on arrival might have been a problem. We had arranged a definite time to meet but this was flexible. It proved seamless and he arrived within minutes of our contacting him and we got in earlier than expected. There was parking close by, and though not secure, it was fine. The apartment itself was spotless and everything seemed new. All of the facilities worked well and a balcony gave a sense of space to what was already a generously sized apartment. There were a couple of supermarkets nearby so that self catering was easy. Access to the Old Town was relatively easy, only a 10 minute walk to the Old Bridge. This meant that there were plenty of restaurants to choose from and walking back to the apartment felt safe. On leaving our host again contacted us to ensure that all went smoothly. Great Apartment, great Host! Super clean and comfort. The owner was extremely helpful in terms of meeting me for check-in, even when my bus was heavily delayed. The location is less than five minutes from the old town and famous bridge, but is tucked away from the hustle and bustle as well as having modern amenities and being very spacious. Lock in a great price for City Center apartments - rated 9.9 by recent guests. Located in Mostar, near Old Bridge Mostar and Kujundziluk - Old Bazaar, City Center apartments has a garden. Complimentary WiFi is offered. All units come with a fully equipped kitchen including an oven and a living room with a flat-screen TV with satellite channels. A toaster and kettle are also featured. Muslibegovic House is 1.4 miles from City Center apartments, while Mepas Mall is 1.2 miles away. 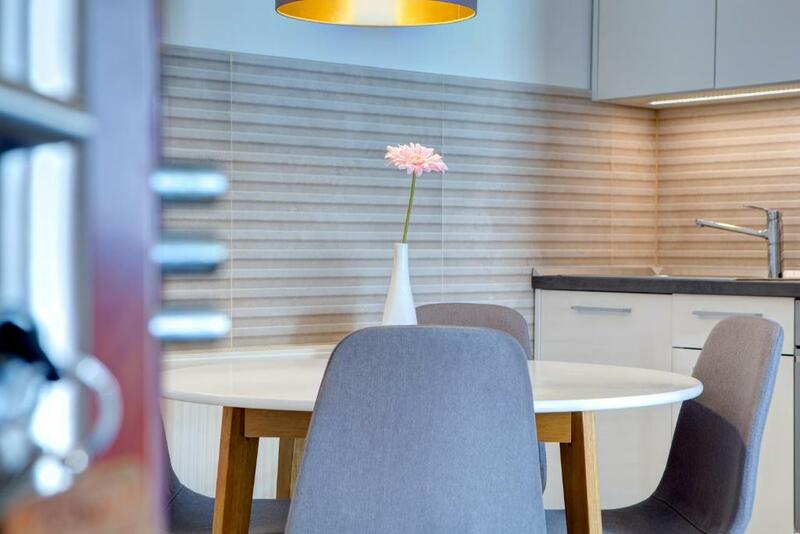 City Center apartments has been welcoming Booking.com guests since 9 Feb 2018. When would you like to stay at City Center apartments? This apartment has a private entrance, seating area and patio. 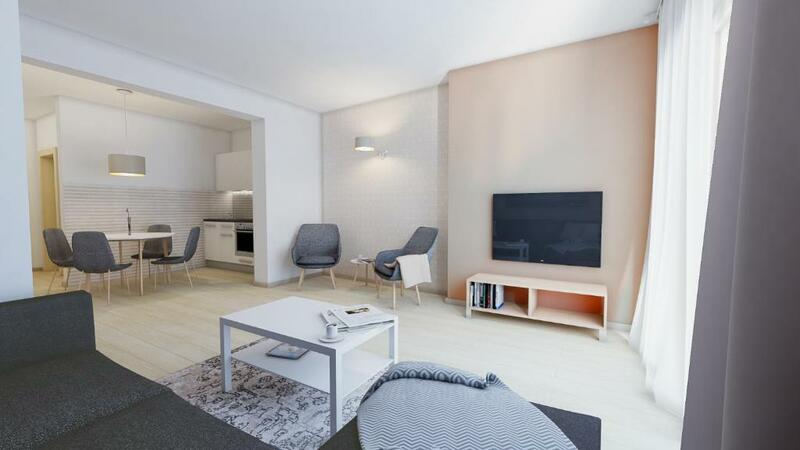 This apartment features a electric kettle, seating area and balcony. 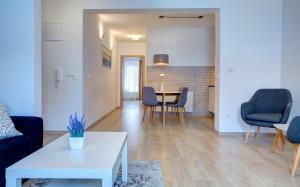 Building/House "City Center Apartments" is brand new property, located in Mostar center, just 200 meters from Old Town. Very quiet neighborhood. There is big supermarket 100 meters away. It has 3 apartments. One Studio Apartment (45 m2), with king size bed, sofa bed and additional bed if needed. Kitchen and toilet with shower Capacity of 4. 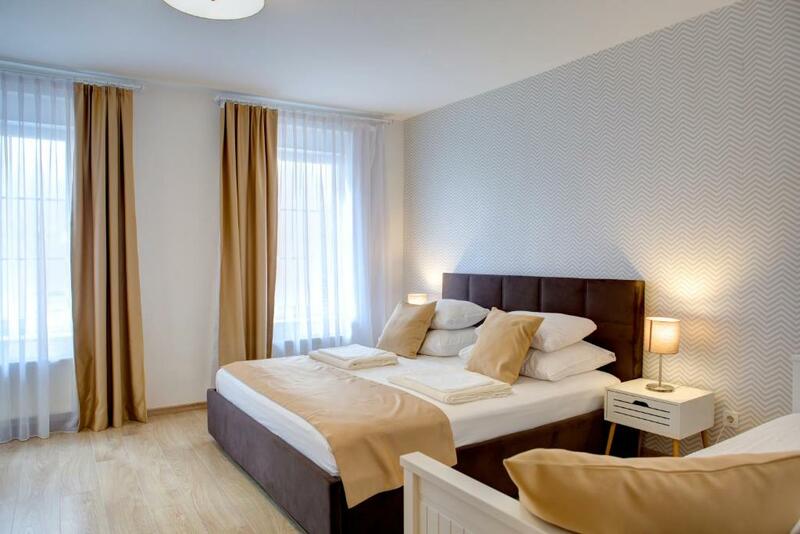 One Apatment with balcony (65 m2), 1 big bedroom with king size bed, double bad and sofa bed. Kitchen and toilet with shower. Capacity of 6. 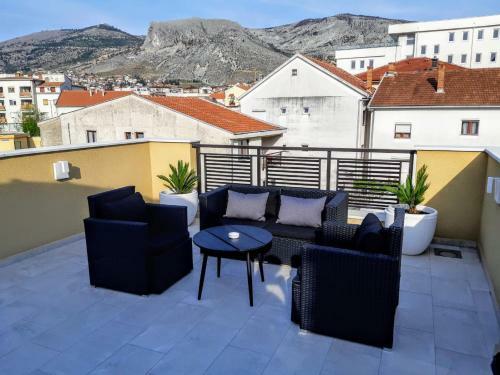 One Apartment with big terrace( aprt. 45 m2 + terrace 23m2), 1 bedroom with double bed, big sofa bed in living room and additional bed if needed. Big kitchen and toilet with shower as well. Capacity of 4. 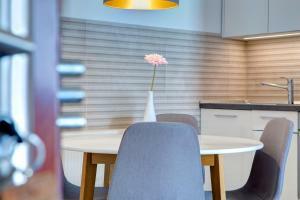 All apartments have air conditioning and central heating. Very quiet neighborhood in heart of Mostar. House rules City Center apartments takes special requests - add in the next step! Please inform City Center apartments in advance of your expected arrival time. You can use the Special Requests box when booking, or contact the property directly with the contact details provided in your confirmation. I could not find anything to not like about this place. Sameer is a great host with excellent communications skills. He was waiting for us on the roadside and showed us where to park. He then showed us the apartment and handed over the keys. 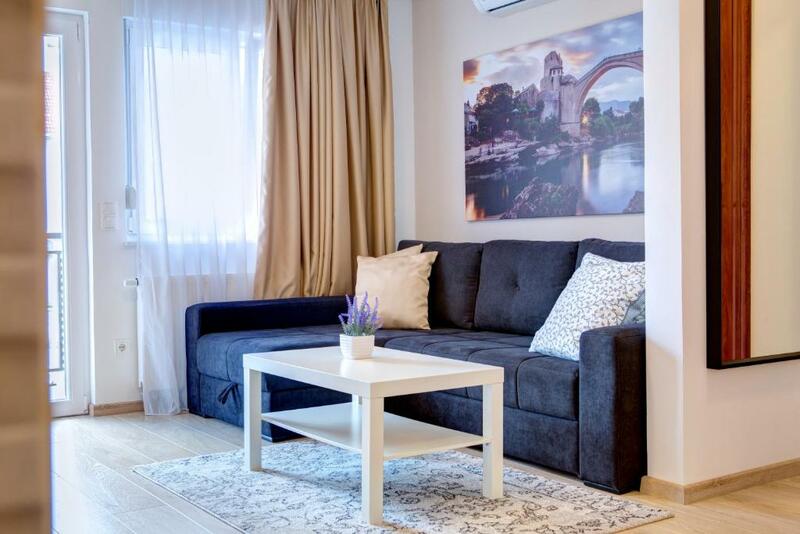 The apartment exceeded our expectations - everything was new, modern, luxurious and very tastefully decorated and most importantly the apartment is quite big. It has a nice terrace to sit outside and enjoy the views of the old church and town. Parking is gated and ample - we felt very secure leaving the car in the parking and we could see it from our apartment. This apartment is very well located - very close to the old town and at the same time away from the noisy streets. We walked to the old town and it was only 5 minutes walk. Road width within the city. Everything in the apartment is perfect. Warning: 1.Don't go to the sniper house alone , it's dangerous inside sometimes according to my own terrible experience. 2.avoid the mini_market around cause sometimes they cheat tourist and the big supermarket just 3minutes walk opposite the street on the left of the Church. I wished I had paid attention to the bathroom pics. Because our apartment is on the top floor, the ceiling in the bathroom and bedroom is sloped, very much like an attic, and since the bathroom space is already tight, the low sloped ceiling was particularly challenging for my 1.7m-tall son. There was nothing to dislike about the apartment. The arrangement to meet outside the cathedral is fine but perhaps suggesting that guests temporarily park in the secure paid car park where tourist buses park would be helpful. Parking otherwise is a bit difficult. Nothing to say! Our stay was great at all! The view was incredible, the way into the old city was accessible, and the apartment itself was sublime -comfortable, clean and cozy. Plus, Samir is one of the best owners we have come across in our travels.